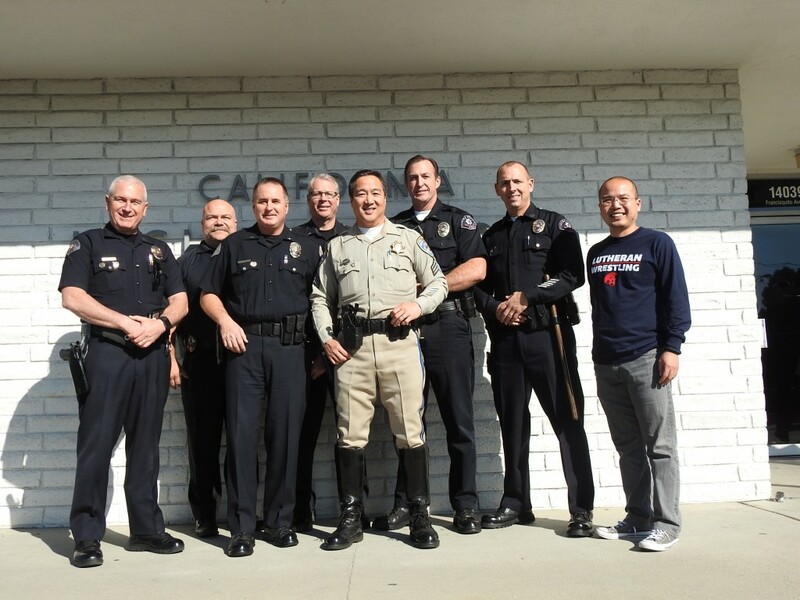 BALDWIN PARK >> Fellow law enforcement officers from throughout the San Gabriel Valley bid farewell to CHP sergeant who headed out for his last shift Wednesday after three decades of service to the Southland. Police from Covina, West Covina and Pomona joined in the morning briefing at CHP’s Baldwin Park area office to send off Sgt. Mike Dulong, the senior ranking sergeant in the CHP, colleagues said. The CHP’s Baldwin Park area office serviced most of the San Gabriel Valley, and CHP officers regularly work with other area police agencies. “He has been an asset to all the agencies in the San Gabriel Valley,” the lieutenant said. The sergeant began his career at the CHP’s Baldwin Park area office in 1986, before transferring to San Jose two years later, he said. Having grown fond of Southern California, Dulong transferred back to the CHP’s Baldwin Park area office in 1989. He moved to the South Los Angeles station when he promoted to sergeant in 1992, but returned to Baldwin Park the following year. Dulong said he kept returning to Baldwin Park because the San Gabriel Valley is his favorite area to work in. “I’m like a boomerang,” he quipped, adding that he enjoyed both dealing with the people and working Southern California’s extensive highway system. Dulong has served as a motorcycle sergeant for the past 11 years, adding that patrolling on two wheels has been his favorite assignment. He said the thing he will miss most about the job is his colleagues, both within the CHP and other law enforcement agencies. This entry was posted in Baldwin Park, CHP and tagged retire by Brian Day. Bookmark the permalink.